University Animal Hospital offers a convenient location, nestled on 66th St. on the Upper East Side of Manhattan, as well the highest possible standard of surgical care for your pets. Our veterinarians are highly skilled and our hospital is well equipped with all the surgical tools necessary to perform minor and major pet surgical procedures, from spays and neuters to more complicated emergency, orthopedic and soft-tissue surgeries. 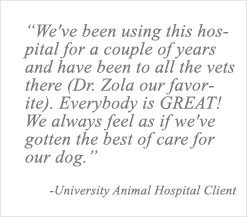 Your pet’s surgery is performed in our state-of-the-art sterile surgical suite. The veterinary team at University Animal Hospital utilizes modern surgical equipment and the latest, most advanced technology to provide your pet with the best surgical care available in New York City. 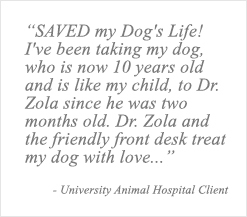 When your treasured companion requires a soft-tissue surgical procedure, the veterinarians at University Animal Hospital are ready. Our experienced, talented medical team performs numerous soft-tissue surgical procedures each day, including spays and neuters, tumor and mass removals, and removal of foreign bodies from your pet’s stomach and intestine. Our years of experience performing these surgeries ensure your pet receives exemplary surgical care. Prior to surgery, your pet receives a thorough physical examination to assess his or her health status. Because not all problems can be detected during a physical examination, we require pre-anesthetic testing. These tests not only give us a more complete picture of your pet’s health, but also allow us to tailor an anesthetic regimen designed for your pet. The veterinary team at University Animal Hospital also utilizes the most advanced surgical and monitoring technology available to observe your pet’s condition, moment by moment. State-of-the-art anesthesia machines and sophisticated anesthesia monitoring devices are utilized for every surgical procedure. Pain management is a vital aspect of our pre-operative, intra-operative, and post-operative anesthetic and medical protocol. All surgical patients, including those undergoing routine procedures such as ovariohysterectomy or neuters, receive pain control medication. If you have any questions about pain management, we urge you to speak with a member of our highly trained medical staff.